The long awaited continuation of Frank Miller’s Dark Knight saga is finally here as The Master Race is unleashed upon the DC Comics readership who have anticipated this title with both excitement and trepidation. The sequel to Miller’s seminal masterpiece The Dark Knight Returns and the not-so-well received and downright bizarre The Dark Knight Strikes Again, The Master Race sees Miller team up with celebrated comics writer Brian Azzarello – known for having penned numerous standout DC Comics stories including Batman: “Broken City”, Superman: “For Tomorrow”, Joker and Lex Luthor (as well as a highly regarded run on Wonder Woman for DC’s New 52). Whilst Miller’s contribution to comics cannot be understated and both Year One and The Dark Knight Returns are definitive Batman stories, his later work was found to be less so and it’s clear that Azzarello has worked with Miller to refine and filter his ideas to deliver something more cohesive and classic that both harkens back to those aforementioned masterworks and simultaneously brings the world of The Dark Knight up to date. In terms of story, very little actually happens in this opening chapter of The Master Race but this simply follows the slow-burn approach that was a key part of the structure of The Dark Knight Returns. Instead, readers are reintroduced to Miller’s world and his chosen cast of characters including the likes of Commissioner Yindel, Wonder Woman, Lara and a frozen (undoubtedly soon to be thawed out) Superman. As with previous Dark Knight instalments there are a wealth of newscast talking heads delivering much of the exposition (as well as conveying commentary on the social and political lanscape) and the Batman’s appearances are kept largely in the shadows before pulling the rug from underneath the reader with a killer final page that will leave many reeling – and counting the days – until the next issue is published. Much is relinquished to the visuals in this first issue and Andy Kubert’s pencils are the star of the show, enriched by the inks of Miller’s long-time collaborator, Klaus Janson. Kubert refrains from wholly mimicking Miller’s style in favour of simply peppering his own with subtle hints of Miller-isms. This is unmistakably the world Miller depicted in The Dark Knight Returns with Kubert delivering panel upon panel of intricate detail that together with Janson’s inks and Brad Anderson’s appropriately muted colours presents an epic, cinematic and nourish visual feast. The Master Race is obviously Frank Miller’s idea but it’s through his collaboration with co-writer Brian Azzarello and penciller Andy Kubert that this eight issue series is likely to succeed where The Dark Knight Strikes Again failed, time will tell but this feels like it has the potential to be the “next” classic Batman story. The bottom line: The Master Race has a lot going for it, despite little narrative progression in this first issue there are hints of big things to come and Andy Kubert and Klaus Janson’s art is nothing short of sublime. 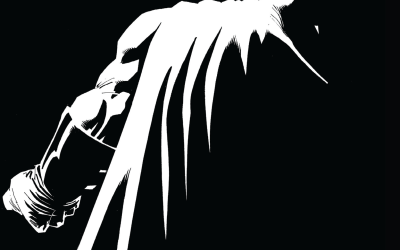 Dark Knight III: The Master Race #1 is published by DC Comics and is available in print and digital formats now. Cover art for DC Comics’ ‘The Dark Knight III: The Master Race’#1 by Andy Kubert. Jessica Jones is the latest Netflix series chronicling the exploits of another of Marvel’s street level characters and having viewed the first two episodes, “AKA Ladies Night” and “AKA Crush Syndrome” I thought I’d offer some quick first impressions. I must confess that unlike Daredevil, I came to Jessica Jones with limited knowledge of the character created by Brian Michael Bendis with only a passing familiarity gained via Bendis’ run on New Avengers from the mid/late 2000’s. I had never read Alias, the title that introduced the super-powered private investigator – something that on the strength of this series I now plan to rectify. Given the quality of Daredevil I still had high hopes for Jessica Jones and I’m certainly not disappointed. Marvel and Netflix have ensured that anticipations would be met and Jessica Jones (at least thus far) achieves what was established with Daredevil and manages to push the envelope further. This is dark, gritty stuff and all the more compelling for it. 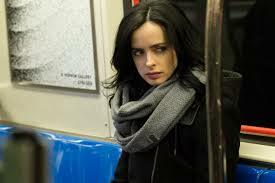 Once again we are taken to the crime ridden streets of Hell’s Kitchen and this time we are introduced to private investigator Jessica Jones, a world weary ‘gifted’ individual who turns to drink in an effort to cope with a traumatic past event and chooses not to embrace her extraordinary abilities as a force for good. As Jones, Breaking Bad’s Krysten Ritter proves to be perfect casting as she effectively conveys a complex mix of sarcastic wit, cynical world view and general brashness whilst also letting subtle hints of heroism seep through (we learn that her one weakness is that she sometimes cares). Jones’s methods as a P.I. are at times questionable (falling foul of lawyer Jeryn Hogarth, played by The Matrix’s Carrie-Anne Moss) but she gets the job done. Also introduced is another of Marvel’s street level heroes as Mike Colter brings the indestructible Luke Cage (due to receive his own Netflix series in 2016) to the screen and in these first two episodes Ritter and Colter are able to establish good chemistry and get the chance to put their abilities to use in a bone crunching bar fight – their first of undoubtedly many team-ups to come. The building storyline concerning Jones’s manipulation by supervillain Kilgrave is mysterious and intriguing, although largely unseen, former Doctor Who star David Tennant makes his presence felt from behind the shadows, with unsettling flashbacks that plague Jones a prelude to Kilgrave’s re-emergence in the present as the mysteries of Jones’s latest case begin to unravel. This is the seedy underbelly of the Marvel universe and is a perfect counterpoint to the family orientated (but no less entertaining) cinematic ventures of The Avengers and I’m looking forward to watching more. All thirteen episodes of Jessica Jones season one are available to stream now worldwide exclusively on Netflix. More perfect Marvel casting – Krysten Ritter in the latest Marvel/Netflix series ‘Jessica Jones’. Just in time for the international release of Spectre, Dynamite Entertainment has launched its first James Bond comic book after acquiring the licence to Ian Fleming’s iconic super spy last year. Written by Warren Ellis, fan-favourite author of the likes of Iron Man: Extremis and Global Frequency, Dynamite’s James Bond #1 presents the opening chapter of “VARGR” and depicts a version of the cold hearted (yet oddly romantic) and lethal spy that is more in line with Ian Fleming’s novels as opposed to the at times tamer and more heroic version of the character often favoured in the Bond film series (a portrayal itself that is every part as valid as the character envisioned by Fleming). Ellis certainly doesn’t withhold on the lethal aspect of Bond, with a tense and thrilling 9-page opening sequence that slowly reveals 007 as he pursues – and violently dispatches – the killer of 008 that will both shock and delight readers. The dialogue here is sparse as Ellis wisely relinquishes the bulk of the storytelling to penciller James Masters, who delivers a moody and partially retro style that helps to evoke the atmosphere and spirit of Fleming. The sequence flows perfectly from panel to panel until Bond himself is fully revealed, the dark haired, smartly suited figure depicted as Ian Fleming imagined (even down to that scarred cheek). What follows is (perhaps deliberately) more slowly paced and less enthralling with Ellis laying out exposition as Bond returns to MI6. If a little heavy, it serves to introduce readers to the supporting characters and an opportunity to become more acquainted with Bond in the hum-drum office environment as he flirts with Moneypenny, receives a dressing down from M and discusses politics with Chief of Staff Bill Tanner in the cafeteria before reporting to the Quartermaster – ‘Q’ – to prepare for his next assignment. It plays out much like a Bond film yet via Ellis and Masters is infused with the feel of Fleming’s novels, giving us a version of 007 that manages to be both reverential and simultaneously all of its own, grounded with a dash of real world concern as Bond is confronted with a new spy-regulating law that prevents him from carrying a weapon on British soil. Whilst largely functioning as a prologue to the overall plot of “VARGR”, James Bond #1 comes to a tantalising close as we’re introduced to the imposing Mr. Masters, the impending threat that will (no doubt) soon be presented to Bond. 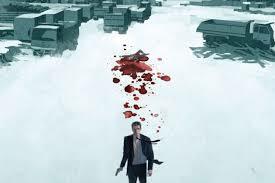 With the measure of preliminary exposition dealt with, here’s hoping that Warren Ellis and James Masters build a sprawling and exciting adventure that’s worthy of the attention of James Bond fans new and old. The bottom line: Despite some heavy set-up, James Bond #1 delivers hints of what could prove to be an appealing new iteration of Ian Fleming’s iconic creation. James Bond #1 is published by Dynamite Entertainment and is available in print and digital formats now. Cover art for Dynamite Entertainment’s ‘James Bond’ #1 by Dom Reardon. Ian Fleming’s James Bond – 007 – returns to the big screen for the 24th official entry in the enduring and phenomenally popular spy film franchise. With the overwhelming success of 2012’s Skyfall, Bond film producers Barbara Broccoli and Michael G. Wilson stoked the flames of anticipation by securing the return of Oscar Winning director Sam Mendes. 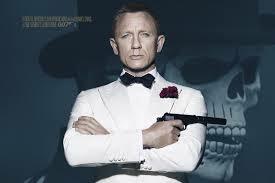 Spectre is a solid and thrilling, yet at times imperfect, follow up to that aforementioned game-changing Bond feature. It’s a well-crafted and often exciting action thriller that perhaps suffers a little under the weight of high expectations and efforts to repeat and surpass the heights of Skyfall and arguably lead actor Daniel Craig’s finest hour, Casino Royale. With Skyfall we were presented with an interesting progression of the modern Bond film which was more firmly rooted in the pages of Ian Fleming’s original novels and cerebral spy serial Tinker, Tailor, Soldier, Spy whilst melding the very best elements of Sean Connery’s tenure as the iconic spy. What Spectre does is strive to heighten those elements to mostly positive results, with a few stumbles. In celebration of what makes a proverbially “good” Bond film there is perhaps a little too much reverence to what has come before, homages to key moments in From Russia With Love, Goldfinger, On Her Majesty’s Secret Service and The Living Daylights (to name a few) are generally pleasing but also evoke a feeling of familiarity that wasn’t present in Skyfall. There’s also an increase in humour which doesn’t always hit the mark (and even in the odd instance threatens to undermine the drama) and the film’s pacing can at times feel a little sluggish. Despite these grumbles, the effects of which will likely diminish upon repeat viewings, Spectre certainly delivers the goods. Daniel Craig makes an assured return as Bond, at ease with his effortless swagger, dapper demeanour and unreserved lethality – the best since Connery and the closest to Fleming’s interpretation of the character since Timothy Dalton. Lea Seydoux, who had a memorable villainous stint in Mission: Impossible – Ghost Protocol, makes for a decent female foil to Craig’s Bond as the sparky Dr. Madeleine Swann and there are some fun moments to be had with Ben Whishaw’s Q and Naomie Harris’s Moneypenny. Just as Whishaw gets his time in the field, Ralph Fiennes – returning as the new M – also gets a piece of the action as well as sharing some great scenes with Sherlock’s Andrew Scott, who plays the chief of a new intelligence agency poised to replace MI6 and the double-0 programme. Spectre also provides a physically imposing (and largely mute) henchman in the mould of Jaws and Oddjob in the form of Mr. Hinx, a terrifying muscular powerhouse that’s an ideal fit for Guardians of the Galaxy’s Dave Bautista. This ultimately brings us to double Oscar Winner Christoph Waltz’s main antagonist, Franz Oberhauser, a shadowy figure with connections to Bond’s past and a requisite agenda of evil. Waltz is simply great with a wonderfully understated and nuanced portrayal that is non-the-less chilling and leaves the viewer in no doubt that he is a capable threat. The film’s action sequences are second to none, aside from the exciting opening in Mexico City that’s on a par with Goldeneye, there are fist fights as bone crunching as those in Casino Royale, car chases that stand shoulder to shoulder with Quantum of Solace and a spectacular high-stakes finale that threatens to rival Skyfall. Beyond its strong cast and adrenaline infused action, Spectre has an intriguing script that crafts an enjoyable contemporary spy thriller that is mindful of the post WikiLeaks climate with twists and turns that, although in some instances are predictable, facilitate moments of genuine surprise. Director Sam Mendes once again guides proceedings with absolute precision, aided by the striking visuals of Interstellar cinematographer Hoyte Van Hoytema who makes the most of rich and varied locales – ranging from Mexico, Rome and Tangier to Austria and London – to present a visually sumptuous film that’s complemented by Skyfall composer Thomas Newman’s score (shame about Sam Smith’s underwhelming theme song) in a flawed but ultimately solid outing for 007. The bottom line: Although not quite hitting the overall heights of Casino Royale and Skyfall, Spectre is still a strong and skilfully executed assignment for Mr. Bond. Spectre is in cinemas across the UK now and opens worldwide on 6th November. Daniel Craig returns for his latest mission as 007 in ‘Spectre’.